After seeing this cross stitch on a friend's Facebook page several months ago, I knew I had to make it for Philip. It's so perfectly him. 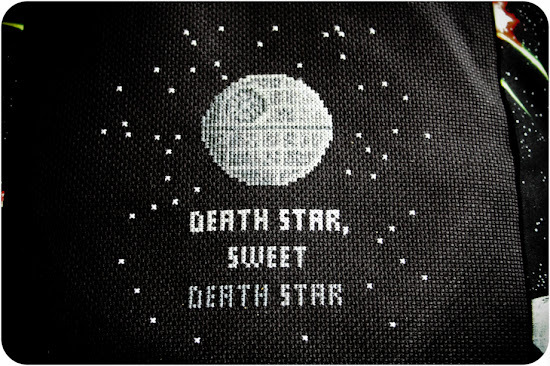 In my mind, as soon as I saw it, I could see a throw pillow on his bed with this cross stitch on the front. The cross stitching was such fun, as it's a craft I so enjoyed in high school and college, but it's probably been more than a decade since I've touched any cross stitching. Once I decided on the project, I had my work cut out for me to find an appropriate fabric to make the cross stitch into a pillow. 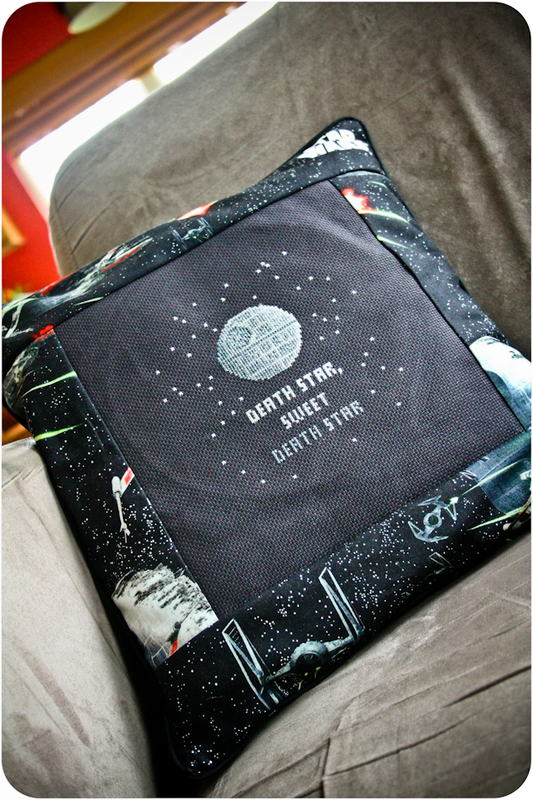 There are many different Star Wars fabrics available, but I specifically wanted one with a Death Star on the fabric. I found 2 on etsy, one with a blue background and one with a black background. Obviously black was the better choice, but I could only find it in a whole yard lot. 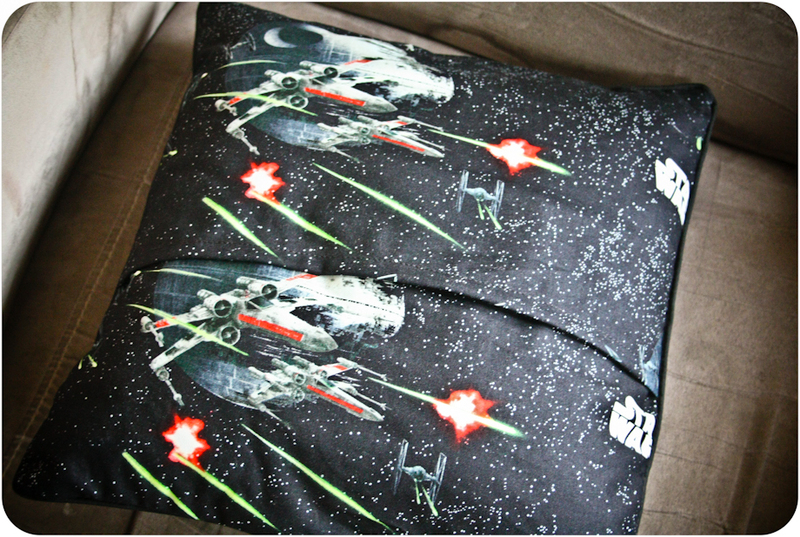 More than I wanted to spend on this project, but when the perfect fabric presents itself, what can you do? I'm sure I'll find a good way to make use of the leftover fabric! 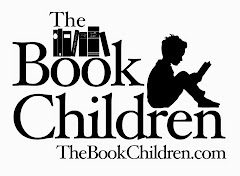 Probably another project for Philip. You can't see it very well in these photos, but I chose piping to go around the edge of the pillow between the front and back layers. 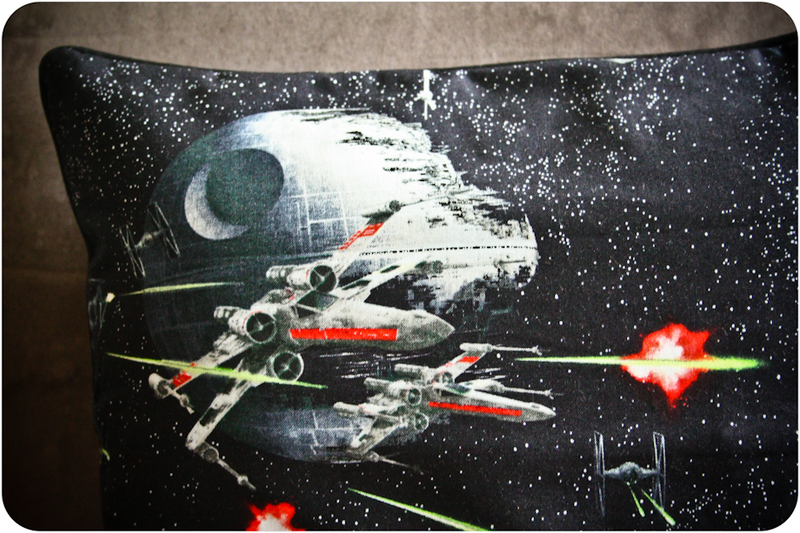 Once I decided and purchased this, I wasn't exactly sure how to sew them together with the piping laying flush to seam. Fortunately, my grandmother came to the rescue. I took the entire project out to her house, and she helped me assemble and sew it together correctly. It looks great! In the back, we decided that instead of a zipper, the easiest closure would be overlapping flaps. The pattern kind of turned out funny because of the intervals of pattern repeat, but that's just how it goes sometimes, I guess. At least he has the entire big Death Star showcased on the back. 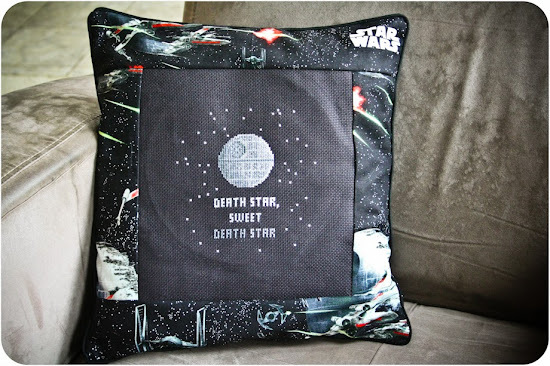 I think you have done a wonderful thing here with this Death Star pillow. I love it. Cross stitch and I haven't been together for a decade either but I still have my first piece I did in 1992. Do you have your first one too ?~! I just showed this to Z and he is crazy jealous!! You did a fabulous job, it look perfect! Maybe a bag or pajama pants with the left overs?